Director Mode can be used to capture HD video from all angles and automatically composite each angle into one video file with every media asset, effect, and transition that you made during your production. Director Mode is great for offline productions that you just need to record. It is also a good way to ensure a high quality video for On-Demand viewing when shooting video and streaming live at locations with limited bandwidth. 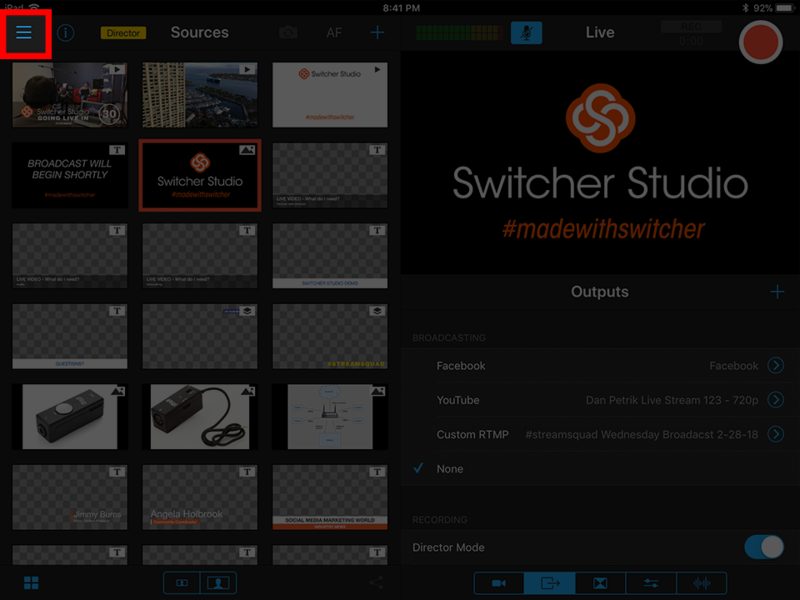 Using Director Mode, you can send out a lower-quality live video stream and capture full HD quality video from each device to composite later. Director mode also integrates with Switcher Studio Media Manager for Mac, which allows you to send your final composition with all angles to your computer and export to Final Cut Pro X to make edits in post-production. Note: This feature requires that you use a high capacity iPad as the primary mixing device. There must be enough storage on the primary mixing device to store video from each angle when building the composition. 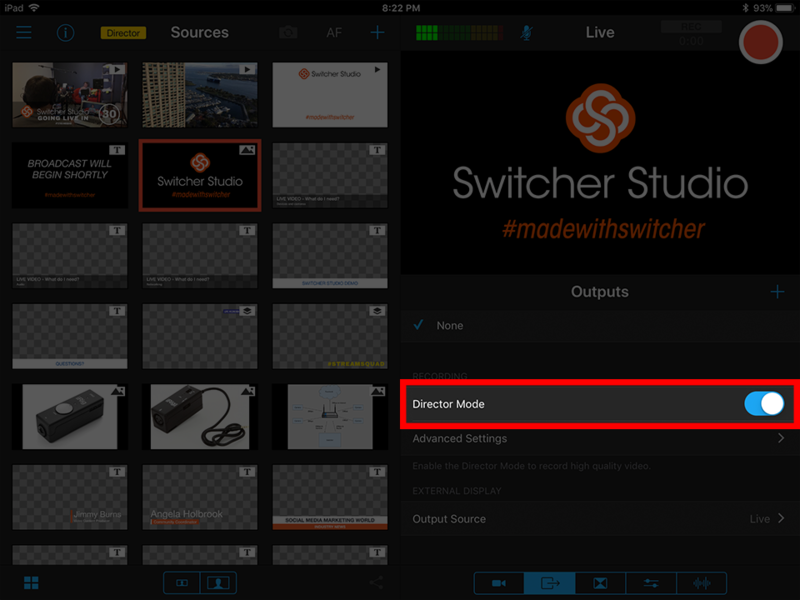 To enable Director Mode, open Switcher Studio and tap the “Director Mode” toggle in the Outputs tab. A dialogue box will appear informing you that the built-in camera will be disabled. Select "Continue" to move forward or "Cancel" to go back. Once enabled, a yellow “Director” icon will appear on the screen to indicate that the feature is active. Next, go to the "Inputs" tab, connect your devices (up to nine) and produce your event as you would normally. Once the event has ended, you will need to compile the clips. Depending on how long your event goes, this can take some time. You do not need to compile the video immediately, you can reconnect devices and create the composition later. To compile the video, make sure all of your devices are on the same network and connected to the primary mixing device in the "Inputs" tab. Next, select the "Recorded Media Bin" icon in the upper left on your main mixing device. 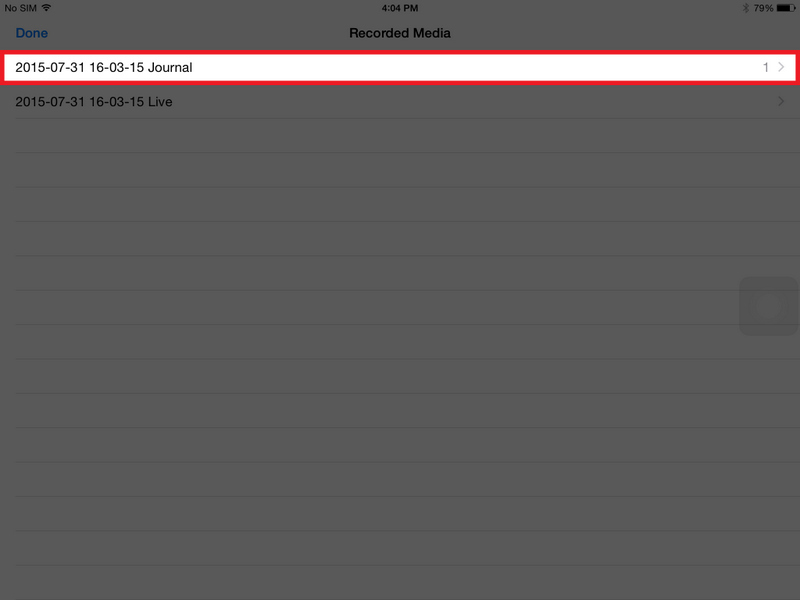 In the recorded media bin select the file from your session titled “Journal”. 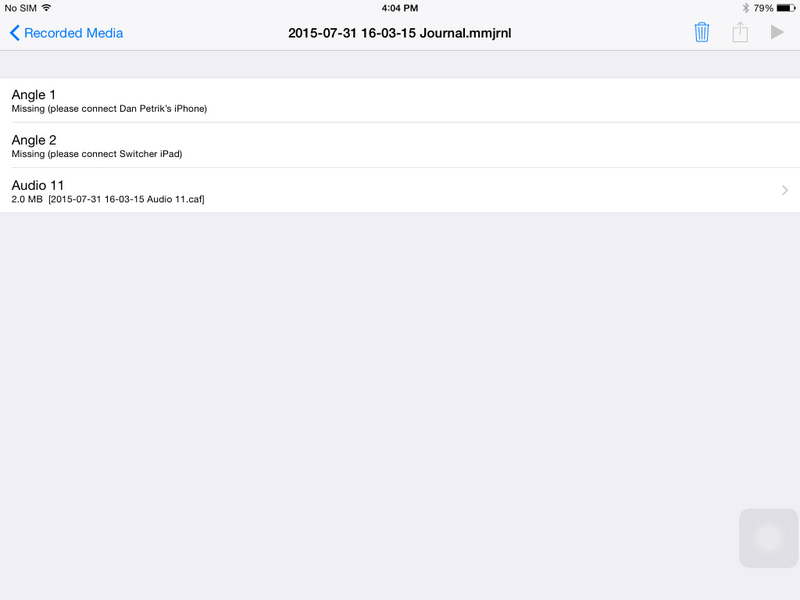 The different angles from each device will be listed in the journal file and start transferring to the main device (make sure you have enough storage on your main device to store video from all angles). If you get the message “Missing (Please Connect Device)", then not all of your devices are connected. 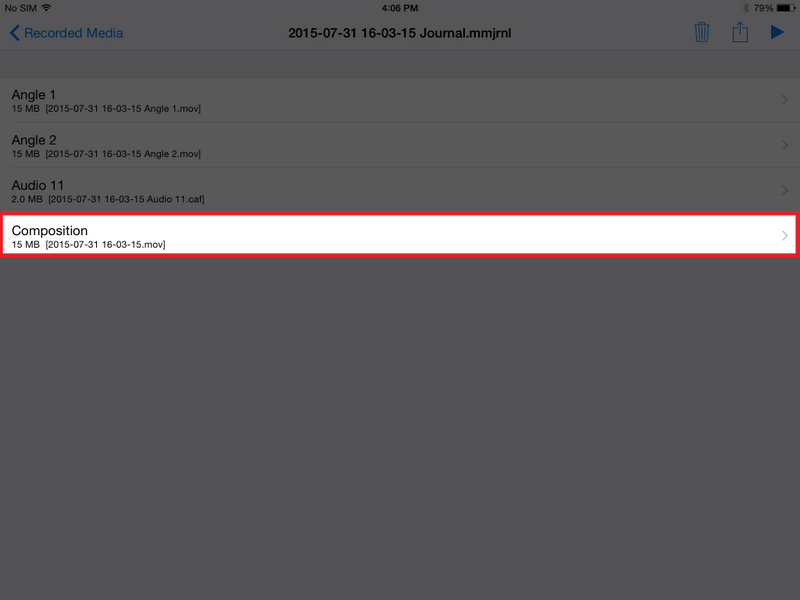 Go back, connect your devices, and return to the "Journal" file in the recorded media bin. A progress bar next to each angle will indicate when the transfer is complete. When the files finish transferring to the main mixing device, Switcher Studio will automatically begin building the composition. 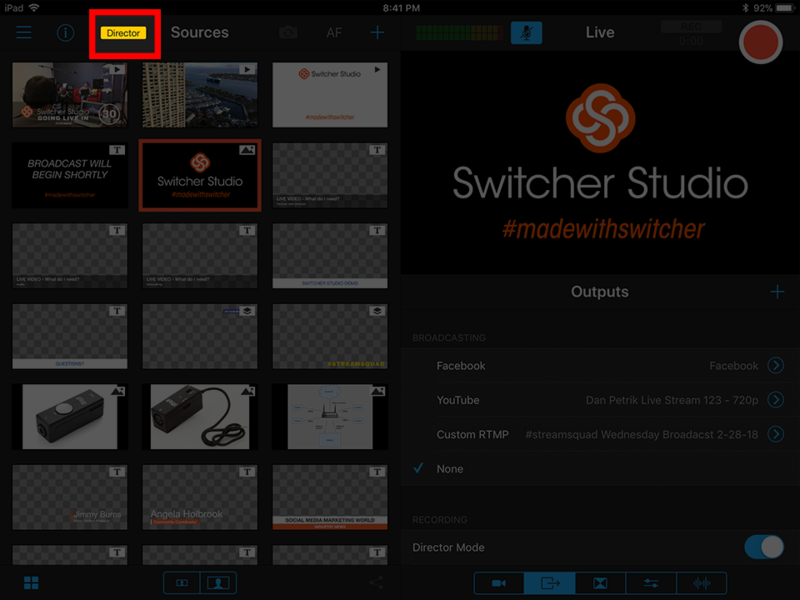 Once the composition is complete, you can tap on the composition to view your recording.